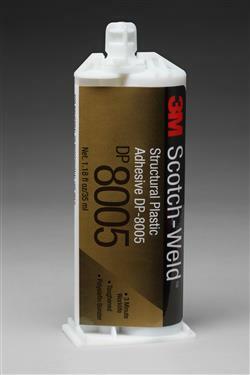 3M(TM) Scotch-Weld(TM) Structural Plastic Adhesive DP8005 is a two-part acylic-based adhesive. 10:1 mix ratio, 3 minute work life and handling strength in approximately 3 hours. 3M(TM) Scotch-Weld(TM) EPX(TM) Plus II applicator and mix nozzles are required (not included). 3M(TM) Scotch-Weld(TM) Structural Plastic Adhesive DP8005 can bond many low surface energy plastics, including many grades of Polypropylene, Polyethylene, and Thermoplastic Elastomers (TPE`s) without special surface preparation. Jaco Aerospace and Industrial is your one stop resource for 3M(TM) Scotch-Weld(TM) Structural Plastic Adhesive DP8005 is a two-part acylic-based adhesive. 10:1 mix ratio, 3 minute work life and handling strength in approximately 3 hours. 3M(TM) Scotch-Weld(TM) EPX(TM) Plus II applicator and mix nozzles are required (not included). and all of your 3M Products, Tapes, aerospace and industrial needs.